I take pride in my involvement in the competitive speaking art that is forensics. My accomplishments include being a nationally awarded collegiate forensics competitor, active judge, accomplished coach, and advocate for the art of competitive public speaking and oral interpretation. Competitively, I had a distinguished and lauded collegiate career, earning more than 100 individual competitive awards including 17 national individual awards and contributing to more than two dozen state, regional, or national team awards. I competed in six national tournament final rounds and in 2005 was awarded 5th Place overall speaker in the nation at the National Forensic Association (NFA) National Championship Tournament. In 2006, I improved that ranking and was awarded 4th Place overall speaker in the nation at the NFA National Championship Tournament. 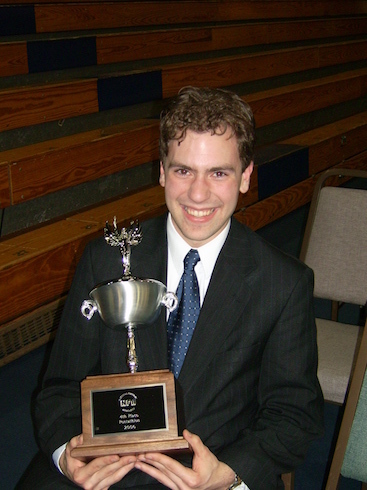 Amongst my other honors I was state champion in both Extemporaneous Speaking and Impromptu Speaking at the Minnesota Collegiate Forensics Association (MCFA) state tournament for an unprecedented three years in a row (2004, 2005, and 2006). Scholastically, I served as a Panel Member on “Coaching Impromptu at the High School Level” for the 2005 Communication and Theatre Association of Minnesota’s annual conference. Amongst the honors earned during my collegiate career, I was named to the 2006 American Forensics Association – National Individual Events Tournament (AFA-NIET) All-American Individual Events Team, was elected the District IV Representative to the 2005-06 AFA-NIET Student Executive Council, and served as the Council’s first elected Secretary. 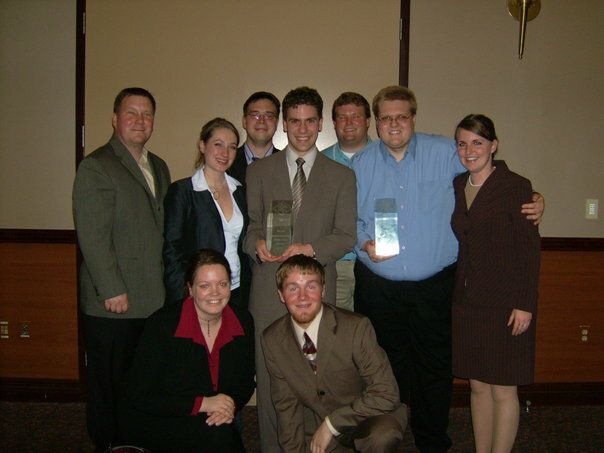 However, the most touching moment of my collegiate forensics career was when my peers awarded me the AFA-NIET District IV Kevin Heineman Student Award in 2006. After college I continued to be involved with forensics, judging at various collegiate and high school tournaments, including the MCFA state tournament, the Wisconsin Collegiate Forensics Association state tournament, the AFA-NIET, and the NFA National Championship Tournament. I also have given back to the activity by serving as tournament staff for multiple AFA-NIET District IV Qualification Tournaments and for multiple Michael Nicolai Collegiate Forensics Tournaments at the University of Wisconsin – Stout. I have coached competitors for various forensics programs as well. These accomplishments contributed to my induction into the NFA Hall of Fame in 2013, an honor I find momentous and humbling. The National Forensic Association Hall of Fame honors those that made an impact while competing in forensics and continued to make an impact after leaving the activity. Inclusion to the NFA Hall of Fame includes not just achievements at the NFA National Tournament, but also the overall achievement of the individual, including the development of forensics, of NFA, of good interpersonal relations with other competitors, and the development of their careers. The AFA-NIET All American Team recognizes students who demonstrate success and good conduct in the forensic activity; excellence in classroom studies as evidenced by grade-point average, range, and challenge of study; and show a commitment to the betterment of their community. The award serves as a crowning touch to those seniors who have demonstrated outstanding qualities in all three areas. The AFA-NIET District IV Kevin Heineman Student Award recognizes one outstanding student from District IV (Iowa, Minnesota, North Dakota, Nebraska, South Dakota, and Wisconsin) chosen by their peers as an outstanding member of the regional forensics community. The AFA-NIET District IV Kevin Heineman Student Award is awarded based on the leadership, fellowship, and sportsmanlike conduct witnessed by the students and coaches of the district throughout the recipient’s collegiate career. The award is named in memory of Kevin Heineman, a beloved coach at Hastings College who exemplified the true spirit of competition, excellence, and honor. The AFA-NIET Student Executive Council serves as the body for students attending the AFA-NIET to express their opinions. Additionally, the Student Executive Council elects the Student Representative to the AFA-NIET National Committee. Matthew served as the first elected Secretary of the Council. 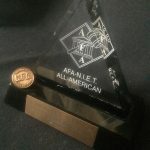 An analysis of the AFA-NIET All-American award and the NFA Hall of Fame, the highest non-competition awards for collegiate forensics competitors. My involvement with the forensics program at Mankato State will always be one of the most memorable experiences in my professional career. I shall always remember the students with whom I worked and appreciate the memories they have given me. That is why I have added the scholarship fund to my will. I hope you will join me in supporting this valuable scholarship.